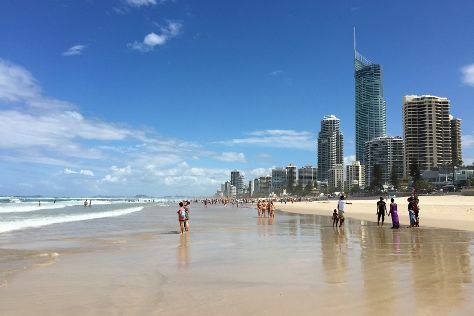 You'll get in some beach time at Surfers Paradise Beach and Coolangatta Beach. Escape the urban bustle at Lone Pine Koala Sanctuary and Pelican Feeding. You'll find plenty of places to visit near Gold Coast: Moffat Beach (in Caloundra) and South Bank Parklands (in Brisbane). There's much more to do: enjoy the sand and surf at Burleigh Heads Beach, enjoy breathtaking views from SkyPoint Observation Deck, get in on the family fun at Sea World Theme Park, and tour the pleasant surroundings at Currumbin Wildlife Sanctuary. For photos, other places to visit, and tourist information, refer to the Gold Coast day trip planning website . If you are flying in from Malaysia, the closest major airports are Brisbane International Airport and Gold Coast Airport. Expect a daytime high around 30°C in April, and nighttime lows around 19°C. Finish your sightseeing early on the 6th (Sat) so you can travel back home.